Warkworth is a beautiful, quaint old Northumbrian Village almost completely surrounded by a loop in the River Coquet, about a mile from the coast. At one end of the Village sat atop the hill is the stunning ruin of Warkworth Castle (an English Heritage site) and at the other sits the parish Village church of St Lawrence. The Village itself has thankfully been left almost untouched by modern life and tourism, it's easy to picture what life would have been like here in the past. In between the Castle and the Church are many Inns, upmarket shops and galleries, gift shops and tea rooms. 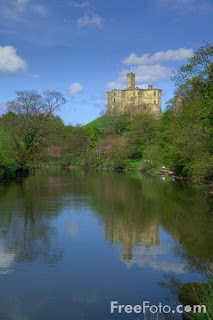 Attractions: Warkworth Castle, Church of St Lawrence, Beaches, Galleries, Shops and Tea Rooms. By far the easiest way to visit Warkworth is by car. There is a public car park in the little square off Bridge Street in front of the church. This does tend to be very busy all year round, fortunately there is further parking by the river. Head past the church and around to the left and you will find further parking in a beautiful riverside setting. Perfect to feed the ducks or have a picnic. Arriva buses do run through the Village, they have a route that connects Amble and Alnwick that has stops on Bridge Street and Castle Street. See the useful links section below for more information and timetables. The nearest train station to Warkworth is approximately four miles North, just outside the Village of Alnmouth. At the other end of the Village, right by the banks of the River Coquet is the parish church of St Lawrence. This a beautiful and peaceful location with the River flowing gently around the Churchyard. A church has stood on this site for almost thirteen centuries, and you can certainly feel the incredible history in it's walls. The Warkworth Flower Show, held in the Castle grounds each August is a great day out for the family with lots of entertainment and stalls. 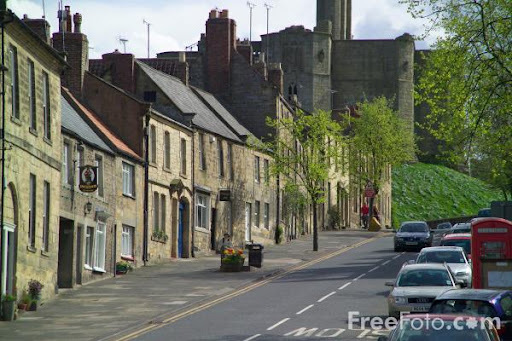 For it's size Warkworth has many pubs (or Inns), most of which are on the main road that runs through the centre of the Village. Warkworth is a surprisingly dog-friendly place as all the Pubs in the Village allow dogs into the bar area. There are also a few restaurants, most of which are small and intimate and offer excellent quality, locally sourced food. There are even a couple of Tea Rooms and deli's thrown in for good measure, making the choice of where to eat and drink Warkworth a difficult one! There are no supermarkets in the Village of Warkworth, there is however a village store on the main street through the Village. The aptly named Warkworth Village Store sells everything you would expect from a small Village Shop. It has a post office, sells national lottery tickets, newspapers, magazines and a good range of food and fresh vegetables. The nearest supermarket is in Amble, a short drive towards the coast where there is a Tesco Express. Not far away, just outside the Village of Acklington is the Warkworth Farm Shop and Tea Rooms, they offer excellent quality local produce and have a play park for the kids. For larger supermarkets it is best to head towards Morpeth or Alnwick, both have a good choice of places to shop. Warkworth Community Cinema is based in the Village Memorial Hall and shows at least one film screening per month. It's an eclectic and enjoyable mix of the mainstream and world cinema and it's well worth checking if a film is showing while you're in Warkworth. The Memorial Hall is located on Castle Street and has a sign above the door 'Warkworth War Memorial Institute'. The Hall is also available for hire for parties and has a license to serve alcohol.